One of the most common statements I get after doing one of my whitetail (bootcamp) hunting educational sessions is how much I "detail" a stand set-up. I always thought everyone did this but apparently not. There are many pieces of the puzzle to consider, in fact, too many for this short article. But I did want to touch on a few details to get guys to thinking, if nothing else it will make you consider some secondary options. I'm purposely going to try not to even get into the "big picture" regarding land contours and/or structural positioning. This will not be an "easy read". It might even seem confusing and possible questions will arise. But the fact is it will make you a better hunter. Feel free to draw out little schematics if it will help you to understand. Three must-haves for your 2014 Deer Season! Once in the right region you must pick the right tree. I've said many times before I prefer a mediocre tree in a great position over a great looking tree in a mediocre spot. The fact of the matter is it's not often you find a great tree in a great spot. Deer know when the forest is disturbed and when it's not. If things are too quiet, it alarms them. These squirrels are undisturbed, unless they happen to be exhibitionists. One of the most important aspects of a great stand is an entrance/exit that will create as little disturbance as possible. Hunting an undisturbed area is fundamental. There is a normal rhythm in nature. When everything is copasetic there will be the normal "buzz." Background noises of birds, insects, frogs, etc. are accepted and expected in the everyday norm. Temporary silence is a sign of disturbance. Area wildlife will pick up on it. I learned this little tidbit from John Wayne. He was sitting around the campfire one night when his buddy (note... NOT his partner) said, "It's really quiet tonight." To which the Duke answered, "Yeah... TOO quiet pilgrim." That's one of the reasons I'm an advocate of arriving an hour early over a minute late in most stand situations. I want that buffer to lessen the adverse effects of my disturbance. Disturbing the "buzz" is also why I'm a big advocate of quietly remaining in position once the ambush has been established. Changing stands, leaving for and/or returning from a lunch break, a potty-break or whatever, will all disturb the normal buzz, thus costing you a half hour before common expected noises return. Game in the immediate area will definitely pick up on this. A low impact entrance/exit is vital. The smart hunter must consider sight, sound and scent in his approach and departure. Let's use an example of each in illustration. Often your stand placement might be just off the crest of a ridge-line. HUMAN nature is for old logging/skid roads to follow the crest of a ridge. It just makes sense for ease of travel for humans and equipment. But it doesn't make sense for the deer. Although not always the case, game will shy away from being sky lined on a ridge top. They will normally tend to walk parallel to the crest on the downwind side. It will depend on the angle of the terrain and visibility (density) but usually they will prefer just far enough off to the side to keep their silhouette not obvious, yet passage where they can see downhill more so or equal to being crested. You'll also notice their passage will tend to be on the downwind side of the crest. Think about it. It's just common sense. They can see just as well or better downhill; they can wind/scent check areas upwind and still not be silhouetted. We, as hunters, must do the same thing. When entering a stand site along a ridge line it's easy to walk the logging road along the top. This is fine when it's dark (another advantage of stand approach before light). But when it's already light, or in the afternoon, you're usually better off picking your way in walking parallel to the crest. If you do walk in on a logging road, I try to walk in the "tire track" of the downwind side. In other words as an example, say the logging road is running north/south and the wind is coming from the west. You walk in the east tire track so the wind carries your residual ground scent off the road. This insures any deer that happen to be walking the logging road later will be less likely to smell your passage. Adjunctive to this, if you use a scent drag on approach you will notice it will benefit you even more so. Tie a scent soaked rag to a short cord off a four foot switch (or your bow tip) and drag it (in the example above) down the west tire track while you walk the east (downwind) track. Because I'm a sweater I normally carry my extra coats/gear in a backpack. When I get within 100 yards or so of the stand I'll stop and put on my layered jacket, facemask, gloves and safety belt/harness. To ensure a silent approach I like to rake out steps to the stand. It's an obvious advantage on having your scent on final approach blowing away from the direction you think the deer will be coming/going. 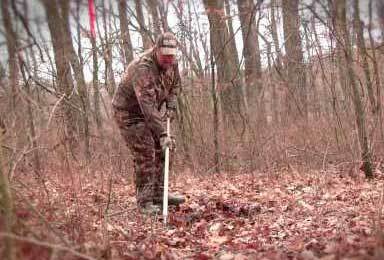 Raking footsteps in leaves allows you to create a quiet approach to your stand in late fall. I've been doing this for years. will insure the bear a more silent approach. The subordinate will actually place his feet in the exact same footprint as a previous entrance/exit for a more silent approach. I like to do a similar thing when approaching my stand site. After the foliage drops in the fall you'll have six inches of dry leaves covering the ground. Trying to walk though dry cornflakes quietly is pretty hopeless. If there is a cadence/rhythm to your gait it's almost impossible to keep your entrance/exit covert. Therefore, I'll use the "bear trick" to my advantage. Preseason I'll take a regular garden rake (the one with the stiff teeth, not a yard/leaf rake) or a hoe and clear away the fallen leaves every couple feet for quiet foot placement. This is especially important on quiet days or if within hearing and/or sight of a known bedding area. Of course there are variables but I've often quietly slipped into a pre-set, pre-raked stand and taken advantage of the situation. 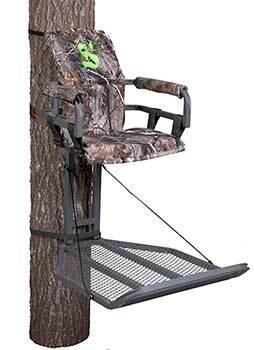 You'll quietly climb into the stand and fifteen or twenty minutes later notice an ear twitch only 100 yards away. Binoculars will confirm it's a bedded deer and you'll suddenly realize there would have been no way in hell you would have gotten to that point and into the stand unknowingly had you not pre-raked your approach. After I rake my steps in I take my trusty ratchet hand pruners and clear away any underbrush I might brush against going in/out. This is not only just for minimal scent retention but for less noise of the under-story rubbing against the fabric of your pant legs. This is all just common detailing. I should note here I tend to weigh the odds accordingly. For example, on approach to a stand it's just smart hunting to not walk down or across game trails on entrance/exit. BUT if you think a circling approach will disturb too much area I opt for a more direct approach and actually cross the trail I'm hunting. In example, say you are hunting a main travel pattern running east/west. The stand is on the north side of the trail hunting a south wind. Your most likely approach might be to circle the stand and come in from the north. But if you do that you might be disturbing too much area and defeat your covert purpose. So, your best approach will be to walk in from the south where you have pre-raked and clipped a low impact entrance. 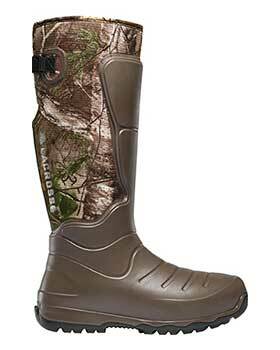 When you hit the east/west trail, wearing rubber boots, just step across the trail leaving minimal scent and disturbance. Just to be on the safe side I ALWAYS in situations like this cross the main east/west trail right IN a shooting lane. That way if you should happen to leave any minor ground scent when crossing and deer stop to check it out at least they'll be standing broadside in a shooting lane. This is another applicable situation for "bowling for bucks." 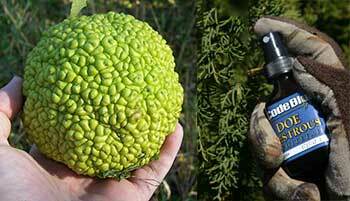 On the way into the above scenario I like to pick up a couple hedge apples (Osage oranges) with gloved hands. For those not familiar with them, they are the fruit of Osage trees. They are yellowish/green, about the size of a grapefruit, with a coarse texture on the outer surface. The outer surface is grooved in a squiggly pattern looking similar to a brain. To make it somewhat confusing, hedge apples and Osage oranges are the same thing... when comparing apples to oranges. 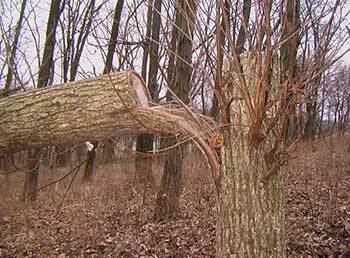 Farmers use the trees themselves for fence posts because they tend to take a long time to finally ground rot. Hence the term "hedge row." And of course we all know the Osage wood is commonly used to make beautiful bows. Anyway, after climbing into my stand I'll take the hedge apple and run a bead of scent/lure around the fruit. By the way, those who don't have Osage in their hunting area can use a regular apple. It's just that the grooved outer surface of the Osage will accept the scent (especially a gel scent) better than the smooth surface of an eating apple. After running the scent around the apple while in my stand I then throw/roll it across the trail right through my shooting lane. Using the same above scenario, if you approach the stand from the south with rubber boots, cross the east/west trail in a shooting lane, then roll a scent laden apple across the trail from north to south, the trap has been set. Think about it. The deer comes walking down the trail until it hits the residual scent laid down when the apple rolled across the trail. Because of his ability for directional tracking he'll stop in the trail and look the direction the scent was rolled/ laid out. It will offer you a broadside shot in a shooting lane at a standing animal upwind of you looking the opposite direction from you. Perfect. No directional, audible bleat needed. Barry uses Osage oranges and deer lures then rolls them down lanes to influence movement. As mentioned above, I'll often play the odds. Bear with me on this. Even though it might be a little confusing this is important stuff. Draw it out if it'll help. Let's use the same hypothetical set-up with an east/west trail, on the north side of run, facing south with a south wind. Say it's more of a morning stand with the feeding area to the west and the bedding to the east. If it's a rut stand you might have deer movement east/west 50/50. But if it's pre-rut or post-rut 70% of the deer might be moving west to east in the morning and 70% movement will be from east to west in the afternoon/evening. I like to play the odds in my favor. Therefore I'll have two additional shooting lanes cut for multiple options. Say you're looking straight south. If you want a broadside shot with the deer going west to east I cross the trail a few yards to the east and roll the hedge apple from straight north to south in order to stop the deer broadside before he cuts my track. This way you are playing the 70% odds over the 30%. If you prefer a quartering away angled shot I cut two additional shooting lanes. Again, you are facing straight south so I'll cut a shooting lane to the southeast for morning movement and another to the southwest for evening movement. If you prefer the quartering away angle you then cross the trail in the morning in your southeast shooting lane and roll your scent ball accordingly across the south lane. The exact opposite is used for the afternoon sit with entrance via the southwest lane. Clear as mud right? Play the odds in your favor. I also play the odds with hinge-cuts and blockages. Before we get into hinge-cuts let's talk about girdling. For those not familiar with girdling, it's a practice where someone cuts a circle all the way around the bark/trunk of an upright living tree. It can be done with an axe, hatchet, handsaw or chainsaw. This will cut off the life-blood and kill the tree. It's a practice used to kill a tree, which will eventually fall and open up the canopy, therefore allowing more light to enter the surrounding grounds to stimulate a thicker understory and better habitat densities. Yes, the tree will die, the problem is it will fall whatever the direction the wind happens to be blowing that particular day. You have no control over it. Whereas, with hinge cutting you create the same effect but are able to control the drop angles to your benefit. If you do any girdling or hinge cutting make sure you have total permission from the landowner and he/she understands what you are doing. Barry uses Hinge Cutting to help direct the deer to within his shooting range. I much prefer hinge cutting so I am in control of the angles. My definition of hinge cutting is cutting the upright tree straight across horizontally until it can be dropped/pushed over in the right direction. Because the tree is not girdled nor cut all the way through, it hopefully continues to live. Yes, the tree will be horizontal to the ground but it should still be able to draw water and nutrients up from the soil. This opens the canopy allowing sunlight into the surrounding area, yet the still alive tree allows for continued leafing and promotes supplemental feed as well as ideal bedding/cover with increased ground level densities. You get the benefit of both worlds. I prefer to use a handsaw on trees that are usually six to eight inches in diameter and usually under forty or fifty feet tall. The hand saw is tougher but it allows me to control the horizontal cut and keep it minimal until I can push the tree the exact direction I want it to drop. Normally I will make my cut just under four feet above ground level. 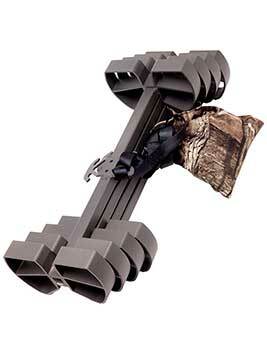 I want to use the hinge cut as a blockage in order to nudge normal deer movement whichever direction I want. I prefer the hinge cut at about four feet because I want the blockage high enough to shift their movement, yet low enough they'll not duck under the obstruction. Because I only hunt with a recurve bow I prefer my shots to be at 12 to 15 yards. Not under 10 yards and not over 20 yards... but that's just me. Using the same directional example of a stand set-up as we did earlier, bear with me on this. The stand is overlooking an east/west trail and you are facing south. But the trail is, let's say, 25 yards from your stand and you want to shift the 70% W/E morning movement about 12 yards closer to you, offering a 13 yd. shot. You pick a tree on your side (north) of the E/W trail and with your saw cutting four feet up, saw until you can swing the drop of the top of the hinge-cut tree to the southwest. This angle is very important. You want the brushy top of the tree (which is wider than the base main truck) to make an obvious barrier to the west to east (70% morning) walking deer. If you drop the tree straight north to south the perpendicular angle might just force the deer to jump over the blockage. If you drop it to the southeast it might angle him away from your stand defeating your purpose. 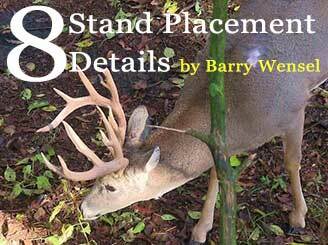 Whereas dropping it at a SW angle will nudge the deer closer to your stand as he angles along the blockage. If you would have dropped the tree in a SE angle on a west to east moving deer he may just swing wide and not give you the shot at all. The obstruction laying SW (in this case) will offer you a 13 yard shot rather than a 25 yard shot. If you want to make sure the E/W (afternoon) movement also is nudged closer to your stand you need to hinge cut a second tree about half way up the SW laying barricade. Drop it so the top faces southeast rather than southwest. Just make sure the base of the second tree is close enough to the first tree so an E/W traveling deer won't slip between the two trees and angle away from you again defeating your purpose. If it will help you to understand please draw these little schematics as explained so you truly understand. The same effect can be reached if you want to shift a deer's movement AWAY from your tree. I personally don't like really close shots at under ten yards. Therefore, you can create an angled blockage right under your tree in order to shift him from five yards to maybe twelve yards. I apologize if this was a little hard to follow along. It's actually very simple but sometimes hard to explain. The bottom line is there will be a lot of satisfaction in your efforts. Not only will you watch a deer react exactly as you wanted and intended him to, but your efforts will hopefully shift his movement into a position where you almost can't miss the sucker-shot. And that in itself will help bowhunting success rates tremendously. 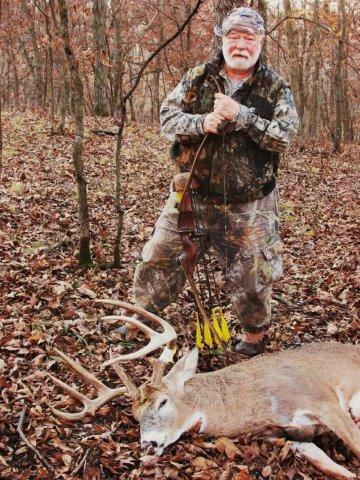 Barry Wensel has taken more trophy deer with his recurve than most of us will see in a lifetime. One aspect of his success is his attention to details that most hunters never consider. Barry enjoys helping fellow bowhunters learn what's taken him a lifetime to understand. His popular 'Bootcamps' walk hunters through a typical deer property, pointing out terrain characteristics, stand locations, funnels and more. These bootcamps are surprisingly affordable and provide a lifetime worth of whitetail hunting expertise. Hit the link below to learn more.